Whether it’s on AdWords, Bing Ads, Facebook, or LinkedIn, the basics for creating a winning online advertisement are pretty much the same. 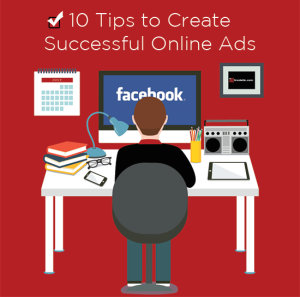 We’ve put together our top 10 tips for how to advertise online and ensure that your online ads lead to real conversions. So, read on! 1. Set measurable goals for your ad campaign. You’ve heard it before, but it’s true. Before you start your campaign, set some measurable goals that you’re trying to hit with your campaign. The key word in that sentence is measurable. Don’t just say, “I want to get more Twitter followers.” Specify how many you want to get within that timeframe. More on that in Hannah’s post, Business Objectives and Marketing Goals. Hint: Keep Them Measurable! 2. Make sure you’re using the right platform and ad type. There are a ton of places you can advertise online: through Google AdWords (and even that is pretty broad – you can advertise on Google itself or their hundreds of partner sites), on Bing/Yahoo, on social media, or on third-party websites. Do some research on your target audience and see what sites they visit and what their online behavior is like. If they’re not on social media, it’s probably not best to run Twitter ads. Conversely, if they’re millennials, Facebook might be more effective than LinkedIn. Get to know your potential customers and then advertise on the platform that’s appropriate for them. When you’re going to create your ad, there are generally two types of ads: pay-per-click (PPC) or cost-per-impression (CPM). Pay-per-click (AKA cost-per-click) basically means that you pay a pre-set amount every time someone actually clicks on your ad. You are not charged every time your ad is shown. Cost-per-impression means that you are charged for every 1,000 impressions, meaning that you pay for every 1,000 times your ad is shown, regardless of the number of clicks it may or may not receive. So which one should you use? Well, that depends on your campaign objectives. We recommend PPC when you are trying to increase sales or drive more traffic to your site. That way, you only pay when someone actually visits your site. CPM, on the other hand, is great when you’re trying to raise brand awareness or you have a new product or business that no one knows about (yet). Tip 2a. Along with using the right platform, you can further reach your audience by targeting by location, industry, behavior, demographics, interests, and more. For example, Facebook lets you target by location, age, gender, language, interests, and behaviors; LinkedIn lets you target by company, job title, school, field of study, degree, skills, and groups. Be sure to explore those options in whatever platform you choose to use. Here at Ironistic, we’re fans of K.I.S.S. – keep it simple, stupid. And it’s true – your ad should be clear, easy to read (no fancy industry jargon), and tell people what you want them to do. Don’t include unnecessary information (and in fact, most ads have character limits that prevent you from doing just that) about your company, your mission, or anything like that. 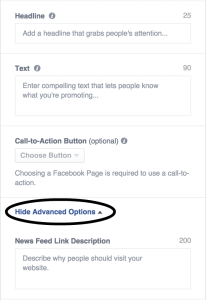 Just focus on what the goal of the ad is going to be – whether that’s getting likes to your Facebook page or getting people to buy your product – and make sure everything in the ad directly relates to that goal. 4. Create multiple ad variations. The great thing about using different ad variations is that you can see which ads are doing well and which aren’t. Then, you can pause ads that aren’t performing as well and create additional ad variations of ads that are doing well (more on that in tip #9). Limited Time Offer – Buy Now! 6. Create specific landing pages with easy-to-remember links. To make your ads even better, create a specific landing page that you can send users to where they can complete the desired action. For example, in tip #4, we want people to sign up for our newsletters, so we’re not going to send them to our homepage and have them search through it to find the newsletter sign-up box. Instead, we would want to create a new page on our site with where people can get more information about our newsletter with strong calls-to-action and a big newsletter signup box. This is especially important in Google AdWords, where the rank of your ad is based on how relevant your landing page is. Tip 6a. Use easy to remember links. www.example.com/newsletter-signup is a lot easier to remember than www.example.com/newslettersignup43840-38402. Where applicable (Google AdWords, for example), you can set one URL to display in your ad but take users to a different URL (your landing page). 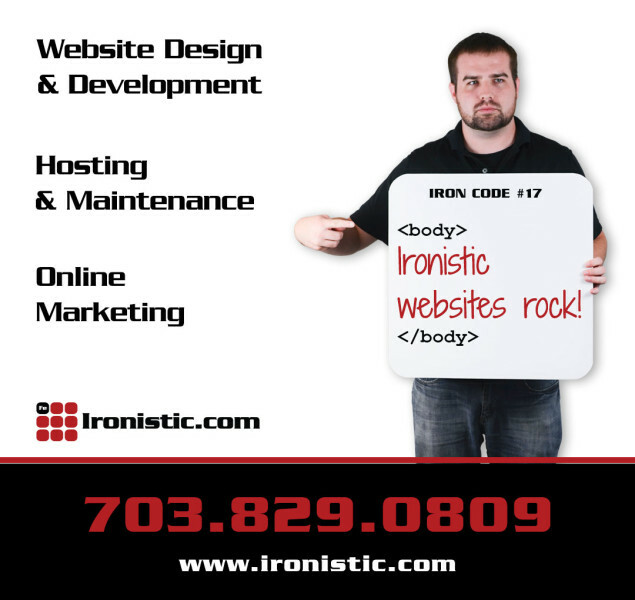 So for example, the display URL in this ad is ironistic.com, but users who click on it will actually be directed to http://www.ironistic.com/digital-marketing-services, a specific landing page that we created especially for this ad. 7. When possible, use real imagery, not stock photos. Trust us, everyone can tell the difference between cheesy stock photos and real company photos. Including a real picture adds a personal touch to your ad. Think about it: how many ads have you seen with overly happy, perfectly well-dressed people crowded around a computer? Been there, done that. But a photo of a few people in your office wearing company swag is sure to catch people’s attention. 8. Include as much information as you can (in the limited amount of space that you have). Most online ads have character limits that sometimes make it frustrating to get the message that you want into that tiny text box. Hence, tip #3. But what you can do is utilize all available text fields in the ad. Similarly, in Google AdWords, you can include callouts and sitelink extensions that highlight additional information about your business. So be sure to explore the different ad options if you’re looking to include more information. 9. Optimize as you go. One of the worst things you can do when you set up an ads campaign is just let it run and then check on it only when it’s over. You should always be optimizing your ad and seeing what improvements you can make. And because you’ve already set up multiple ad variations (tip #4), you can go through your running ads and see what strategies work best. Maybe for your target audience, it’s better to include the call-to-action in the headline rather than in the ad text. Or maybe they prefer image ads over text ads. This is where you can use quantitative data for each ad and make the appropriate changes for ads that aren’t doing as well. For the ones that aren’t getting you as many conversions, you can go through and see what can be improved: maybe you need a stronger call-to-action, or maybe your ad copy is too confusing. Or, you can just decide to pause the ads that aren’t doing as well and instead choose to allocate more money towards the ones that are. 10. Measure the success of the campaign at the end. Go back to those goals that you set in tip #1 and see how you did. Did you hit all of your objectives? What could you have done better? If your campaign was successful – great! Now you can repeat it in the future. If not, see what kinds of improvements you could have made. Maybe go back to the drawing board and re-evaluate your campaign goals, or do some more research on your target audience and find out more about their online behaviors so that you can target them better next time.